Everyone wants the Christmas Countdown in their headlines. CNBC's headline today "Wall Street eyes triple-digit gains as Christmas countdown begins". And doubled that play with this subheading: "Oil plays the role of Grinch this year". The countdown of the year's best already started last week in the Globe and Mail. Today, on the side panel of the Christmas Countdown retrievals is Most expensive celebrity home listings of 2015 and we find out that Michael Jackson's Neverland Ranch was listed at $100 million and the Neverland clock out front remains in place with the return to the name of the ranch before Jackson 'Sycamore Valley Ranch' . It has 2,700 acres. 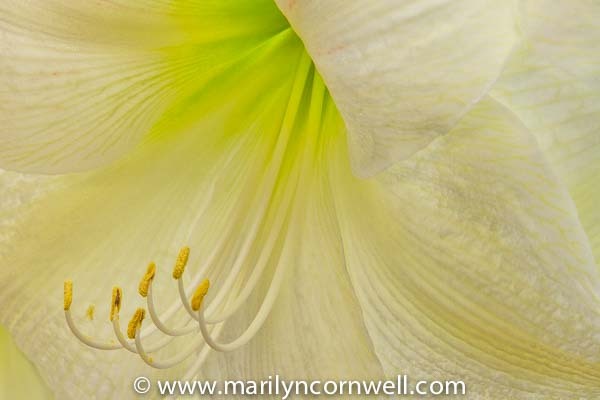 Our floral portrait of an amaryllis today celebrates the first song, White Christmas.